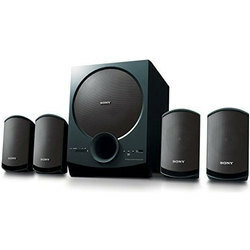 Our range of products include creative sbs a120 multimedia 2.1 speakers, sony sa-d40 4.1 multimedia speakers, sony sa-d20 2.1 multimedia speaker system and creative a50 laptop / desktop speaker 2.0. Easy to use, sleek and designed with many innovative features, this magnetically shielded speaker set from Creative will not only enhance your entertainment room’s decor but also deliver you a rich audio experience. All you need is a USB port to power up this speaker set. 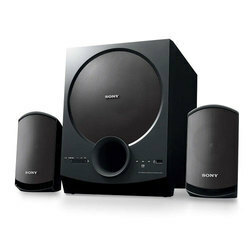 Just connect it with the help of the USB cable to your computer or laptop for an immersive playback experience. 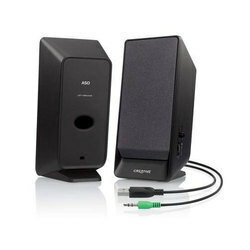 The 3.5mm stereo jack of this speaker set ensures easy connectivity with almost any kind of audio device. 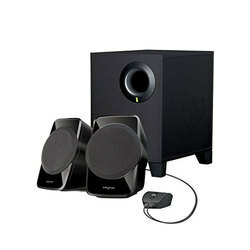 Featuring an inbuilt bass port, this speaker set offers you rich bass while taking up minimum space on your computer desk. The volume control knob and the on/off switch are conveniently located on the right speaker to give you easy access to them.